Calling all graphic artists... Want to help finish the new playlist editor? I've spent the last several days fixing the bugs in the web admin playlist editor, and designed a new over/under layout that will make the playlist editor much more user-friendly. The code is fixed, and the layout design is done, but I am no artist. I'm looking for someone that can use my place-holder graphics as templates and make something that is a little more visually appealing. 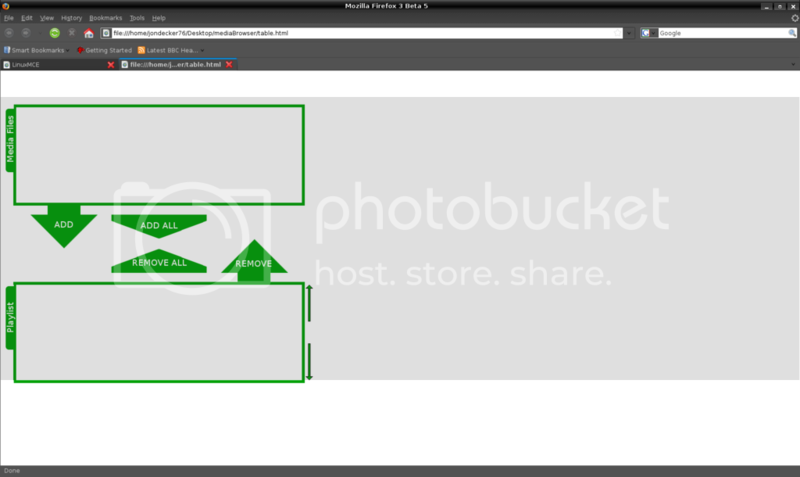 Below is the layout rendered in firefox. Any volunteers? Re: Calling all graphic artists... Want to help finish the new playlist editor? I'm glad to see something happening with the playlist editor, it really needs some help to become usable. I would like to add some suggestions though for the design. Is this interface going to make use of id tags to categorize in folders? If so, how would those folders be traversed. Or instead would it just be hard drive folders as the organization structure. The MD interface obviously makes use of some sorting by gene, group and such, but I'm not even sure if it allows the ability to create a play list there. thanks guys I will definitely like feedback and input. I will post back when things are integrated enough for testing purposes while I wait to see if anyone is interested in doing the graphic work. What do you need? Give me some specs. I'm hoping to have the coding portion wrapped up within the next couple of days at which time I'll be ready some templates to work off of. -Added Vertical layout option (still defaults to horizontal layout) This can be toggled even in the middle of editing a playlist. -Choosing media type "All" no longer shows unsupported media types (i.e. .jpg and other types not supported by the playlist system). This shortened my list from over 4000 to under 1000! Bottom line is that you are only presented with a list of media that will work if added to the playlist. -Changed "Order By" filename/title to "Display As" filename/title. This is much more user-friendly, as there may be some files where you are more familiar with the title, and other files you are more familiar with the filename. -Added feature to gracefully handle files that have no Title attribute set if the user sets to display as title. -Moved general properties such as Playlist Name and Image to the bottom of the page as they are more of a secondary function of the playlist editor. -User privacy is now respected. Only media files that are public or owned by the user currently logged into the web admin are presented to the user for inclusion into their playlist. -various other sorting/filtering bugs fixed. This works great. It is especially friendly to the 640x480 resolution of my 42" TV (old projection type). The playlist editor is working well for me. I have about 4,500 songs and this makes it working with a playlist do-able as opposed to the on-screen version. Some may not know that what you're working on is available in the Pluto Admin Screen, Files & Media > Playlists. I never saw or used the original one but I can say what you've created is easy to work with. I just had a MD in my office playing a playlist I created a few weeks ago and it just stopped (which has been an ongoing problem for me) but at least this time I was able to read in the top left corner that the next tune in the list was unavailable/didn't exist! And with my 4500 songs, how would I search for the song (I know which one it is) in the playlist so I can remove it? Freymann - thanks for the report. The playlist editor doesn't check for the existance of a file, it only relies on the database saying that there is a file. Maybe I will look into a way to actually verify that the file is there as the database says it is. The only problem is that to check it for each file while loading the list seems like a bit of overkill. There are other utilities to make sure your database and filesystem are in sync, so we should probably rely on those. Still, i'm going to try to reproduce it to make sure it isn't something else. When you navigate to a device containing music, the music will be listed on the right hand side. If you scroll to the bottom of that page, you will see a checkbox "Show files who are missing from disk" - check that box. Change files per page to a high number, or all..
then just scroll through all of them looking for the little disk platter icon indicating that the file exists only in the database. You can manually get rid of the entries if you want.. Yes, I think in that case a separate program that can be run to clean things up would be a better solution. Thanks to your instructions, here's what I found is causing my grief with the playlist! When I originally 'tested' things out, I copied some music onto the main drive into the /home/public/data/audio/ directory. When I was ready to move the test core out into the main area, back in mid-June, I then installed my second 'media drive' which contains my entire collection. What I've found is the leftovers.... I likely just manually deleted the batch of tunes I was testing with from the drive, leaving their entries in the database but not on disk. So I selected one "band" and said delete. It took a long time... and it seems to have deleted everything? As now, when I navigate into the media drive, I see only the symbol indicating the things exist on disk only. From the MD in my office, I go to Media > Audio and everything is empty. I guess it will rebuild my audio inventory?? That is weird. I had checked off one band, clicked delete from database, and it deletes my entire audio collection. So stupid me, I check out the main drive in the /home/public/data/video directory and see three directories I deleted, so I click the delete from database button and it wipes out ALL of my video content from the db. The core is busy rebuilding inventory, but this is definitely a BUG. The buttons beside the item aren't passing along the ID I suppose. If we have "media" that can be online/offline.... If I click on Media > Audio > Other > Play All, shouldn't it only include audio that is marked "online"? or how is that handled? (same would be true for video and pictures). I think this explains why my music keeps cutting out at random intervals. The "Play All" thing includes off-line content. Perhaps we need to start a new thread, but after the system deleted all of my music and videos, there's another issue that has appeared. In my video collection (which is rather large too) it rebuilt the inventory, but the "media sub-type" field didn't come back. That meant I had to go over my entire video collection, one by one, and adjust the media subtype to "Music Video" or "Movie" and in a few cases, add back the Genre (I only use that one sparingly). That took 30 minutes.. (but mind you, I didn't bother with the hundreds of short music videos) which really, isn't too bad, but I would generally say I'm not doing that again and leave it. The only reason I walked through all the files is because the "wife" still isn't convinced LMCE is great, and now that I've shown her the attribute controls, to have them suddenly missing isn't going to help me. LMCE has been around long enough that surely somebody else has noticed these bugs?